…repeat until everyone is merrily splashing about in the river. In January. As you do. On Sunday the South West Seals swam with the Wiltshire Wild Swimmers at Tellisford Weir. I have somehow omitted the weir so there may be another drawing if I can find the time. Thank you Wiltshire Swimmers, it was a fabulous away day for the SW Seals and you are very welcome for a re-match on our home ground. Speaking personally: a gentle 10 minutes of swimming was followed by about 6 pieces of cake. We may need to get into some serious training for the re-match! Row Clarke is centre stage here: her fabulous Deakin & Blue cossie teamed with an equally fabulous retro flowery swimming cap. 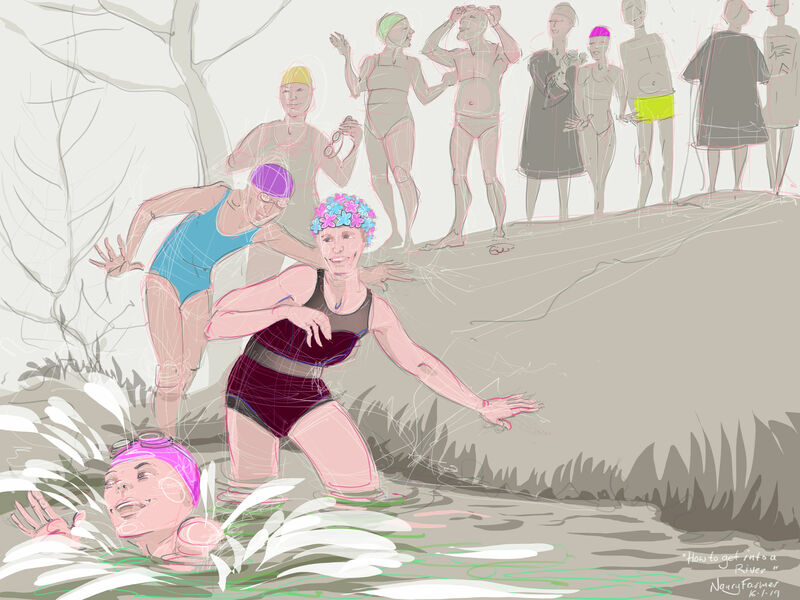 This entry was posted in digital, swimming and tagged art, Deakin & Blue, digital drawing, drawing, river swimming, swimming, Wiltshire, Wiltshire Wild Swimmers, winter swimming on January 16, 2019 by Nancy Farmer.